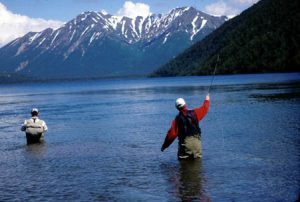 SouthWest Alaska is regarded by many as one of the premier fly fishing areas in the world. As our guest you will venture into this diverse angling territory each day of your fishing week. You can board one of our float planes for a flight to pristine fishing waters with your personal pilot/guide. 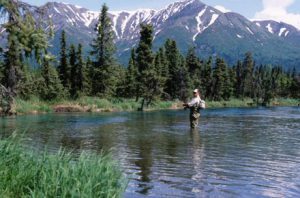 Or travel to the fishing hot spot of the day aboard one of our jet-equipped riverboats plying the finest blue-ribbon fishing streams of southwest Alaska. Our guides are expert angling instructors eager to share our best fishing techniques and get you into the fish. Your fishing safari includes a variety of game fish opportunities. You may choose to fish for our wild rainbow trout, dolly varden, Arctic char and grayling, or go after sheefish, our tarpon of the north. Lake trout and northern pike are also good for a sporty fight and add variety to any angler's adventure in the land of the midnight sun. You may choose to visit virtually any stream in the renowned Bristol Bay/Iliamna area of western Alaska -- the largest natural salmon spawning grounds in the world. Each year millions of sockeye salmon join strong runs of four other Pacific Ocean salmon species in their incredible return to spawning streams. This means excellent angling for 8 to 12-pound sockeye salmon or hefty king salmon weighing from 20 to 50 pounds. Silver salmon can tip the scales from 10 to 15 pounds. Pink salmon range from 2 to 8 pounds. Fresh ocean chum salmon are also available. We also offer specialized, comfortable float trips for the adventurous angler who wants to experience non-stop wilderness fishing. Choose a one-day float trip or up to a week of seclusion on one of our wild and scenic rivers. Weather permitting, set out on a saltwater hunt for deep-water halibut ranging from 20 pounds to a scale-busting 180 pounds! Or as an alternative to the rod and reel, arrange a special day trip to dig for delicious razor clams at the beach.